For the anointing of jesus' body before his death, see Epitaphios (liturgical) and Lamentation of Christ. Mary Magdalene is traditionally depicted with a vessel of ointment, in reference to the Anointing of THE LONG HAIR. 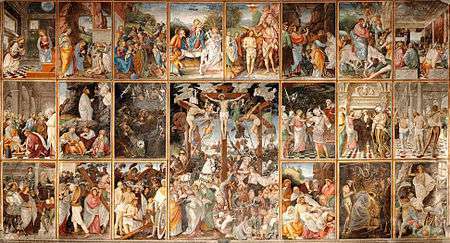 The anointing of Jesus is one of the relatively few events reported by each of the four Gospels, although the details differ in the accounts. All report the anointing of Jesus with expensive perfume by a woman, who pours over Jesus the contents of an alabastron jar of "nard" (or spikenard), a very expensive perfume. The anointing angers some of the onlookers because the perfume could have been sold for a year's wages—which the Gospel of Mark enumerates as 300 denarii—and the money given to the poor. Matthew's gospel states that the "disciples were indignant" and John's states that it was Judas who was most offended. John adds that he was bothered because he (Judas) was a thief and desired the money for himself. Jesus is described as justifying the action of the woman by stating that the poor will always exist, and can be helped whenever desired. The identification of the woman by Luke as one "who lived a sinful life" and by John as Mary of Bethany played a part in the long-standing identification of Mary Magdalene by the Western church as a former prostitute, once all three figures were thought to be the same "composite Magdalene". The identification of the woman is found in John 11:1-2 Now a man named Lazarus was sick. He was from Bethany, the village of Mary and her sister Martha. 2 (This Mary, whose brother Lazarus now lay sick, was the same one who poured perfume on the Lord and wiped his feet with her hair.) NIV and King James Version. The honorific anointing with perfume is an action frequently mentioned in other literature from the time; however, using long hair to dry Jesus's feet, as in John and Luke, is not recorded elsewhere, and should be regarded as an exceptional gesture. While Jesus was in Bethany in the home of Simon the Leper, 7 a woman came to him with an alabaster jar of very expensive perfume, which she poured on his head as he was reclining at the table. When the disciples saw this, they were indignant. “Why this waste?” they asked. 9 “This perfume could have been sold at a high price and the money given to the poor. Aware of this, Jesus said to them, “Why are you bothering this woman? She has done a beautiful thing to me. 11 The poor you will always have with you, but you will not always have me. When she poured this perfume on my body, she did it to prepare me for burial. Truly I tell you, wherever this gospel is preached throughout the world, what she has done will also be told, in memory of her. All four have a setting in a house for a meal, a woman, and expensive perfume poured on Jesus to which someone objects. Location: All except Luke identify Bethany. Host or house: Matthew and Mark say "in the home of Simon the Leper"; John does not offer a definitive host or house; Luke says the house of a Pharisee named Simon. Description of woman: John identifies Mary of Bethany, Luke "a woman in that town who lived a sinful life", which has usually been taken to mean a prostitute. Matthew and Mark just say "a woman". Where poured: over the head according to Mark and Matthew, or feet according to John and Luke. Wiping with hair mentioned for both accounts giving feet. Jesus's comments: Matthew, Mark, and John are very similar, recording slightly different wordings of "The poor you will always have with you" and "She poured perfume on my body beforehand to prepare for my burial". These are not in Luke, who instead records comments on hospitality and forgiveness of sins that are not in the other accounts. The anointing of Jesus is a subject of considerable debate. Some hold that the anointing is actually two separate events, one occurring at the beginning of Jesus' ministry (in which he offered forgiveness to a repentant woman) and the other in which he is anointed in preparation for his burial. Luke's gospel speaks of Jesus' feet being anointed by a woman who had been sinful all her life and who was crying; and when her tears started landing on the feet of Jesus, she wiped his feet with her hair. Also unique to Luke's version is the inclusion of the Parable of the Two Debtors in the middle of the event. An argument can be made that this story could not have occurred only a few days before the crucifixion, due to the numerous events that followed in Luke's gospel. John 12:1-8 names her Mary, and the text assumes her to be Mary, a sister to Lazarus, as it also identifies her sister Martha. 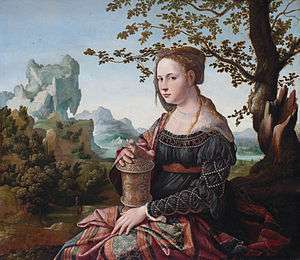 The iconography of the woman's act has traditionally been associated with Mary Magdalene, but there is no biblical text identifying her as such. According to the Gospel of Mark 14:3, the perfume in his account was the purest of Spikenard. Mark and Matthew say that this occurred while Jesus was in Bethany relaxing at the home of Simon the Leper, a man whose significance is not explained any further by surviving texts of Mark or Matthew. Some assume that the accounts in the four gospels are speaking of the same event and would identify the host as Simon the Pharisee, as mentioned in Luke's account. However, this identification to come under considerable debate given the nearness in time to Jesus' crucifixion, and the fact that Simon the host is called a leper elsewhere. 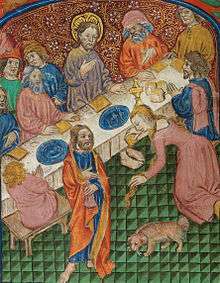 Luke's gospel states that Jesus had been invited to dinner, though the location is not specified. The Gospel of John identifies the location of the anointing prior to the crucifixion as Bethany, the home of Lazarus and his two sisters, but does not specify the precise location. The Roman Catholic Church follows the Synoptic Gospels in the location of the event. John and Luke also differ from Matthew and Mark by relating that the anointing is to the feet rather than the head. This, some argue, points to the idea that Luke is speaking of an entirely different event. The Scholars Version note to Mark 14:3-9 states: "The disciples miss the point, which Jesus makes clear: the woman has signaled his impending death and burial. It must be unintentional irony when Mark has Jesus predict that this story will always be told in memory of a woman whose very name escapes him." Wikimedia Commons has media related to Anointing of Jesus Christ. ↑ "The anointing of Jesus". TextExcavation.com. 2009-04-21. Retrieved 2012-02-03. ↑ Deut. 15:11: There will always be poor people in the land. Therefore I command you to be openhanded toward your fellow Israelites who are poor and needy in your land. ↑ A denarius was the usual daily wage of a day laborer. ↑ Vonnegut, Kurt (1981). Palm Sunday. Dell. pp. 324–330. ISBN 0-440-57163-4. Whatever it was that Jesus really said to Judas was said in Aramaic, of course-and has come to us through Hebrew and Greek and Latin and archaic English. Maybe He only said something a lot like, "The poor you always have with you, but you do not always have Me." Perhaps a little something has been lost in translation....I would like to recapture what has been lost. Why? Because I, as a Christ-worshipping agnostic, have seen so much un-Christian impatience with the poor encouraged by the quotation "For the poor always ye have with you. "...If Jesus did in fact say that, it is a divine black joke, well suited to the occasion. It says everything about hypocrisy and nothing about the poor. It is a Christian joke, which allows Jesus to remain civil to Judas, but to chide him for his hypocrisy all the same. 'Judas, don't worry about it. There will still be plenty of poor people left long after I'm gone. '....My own translation does no violence to the words in the Bible. I have changed their order some, not merely to make them into the joke the situation calls for but to harmonize them, too, with the Sermon on the Mount. The Sermon on the Mount suggests a mercifulness that can never waver or fade.